We were happy to discover new green shops in two Central Business Districts. One of them is a healthy-eats restaurant-store – Sugarleaf. We have visited their Greenhills branch a few months back but it was just too far from our usual itinerary. When we heard that they were opening a new branch in Makati, we made sure we drop by within their first two weeks of operation. Upon entering the new branch, we knew this visit won’t be the last. There were two floors: first floor was a grocery store while the upper floor was the dining area. Since we were still full, we just ordered their turkey sandwich, and lemongrass tea. We liked our sandwich and the tea was refreshing. 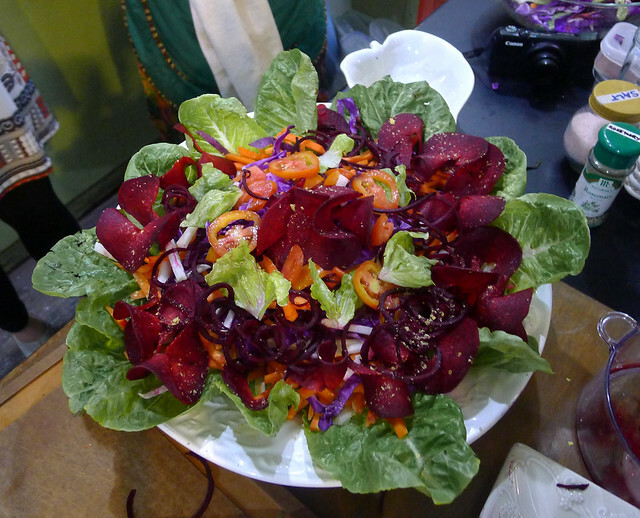 If you want to learn how to prepare similar healthy snacks and dishes for your family and friends, join us on April 14th in “The Beauty of Raw”, another entertaining and lively raw food workshop from Sugarleaf. According to co-owner and Marketing Manager, Angelo Songco, this workshop is a half-day raw food science lecture and gourmet raw food preparation class for those seeking an effective natural alternative to fad diets, surgery, weight loss treatments or depriving calorie restrictions. Talented certified raw food chef and lifestyle coach Mona Lisa Neuboeck will share valuable raw food nutrition information, everyday raw lifestyle tips plus six (6) raw cuisine demonstrations with optional hands on experience and recipes to keep and share with your loved ones. The other store worth-visiting is ECHOmarket. 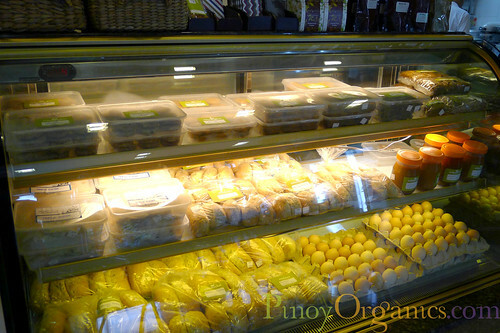 Finally, organic and fresh food and produce are available in one place seven days a week in BGC! 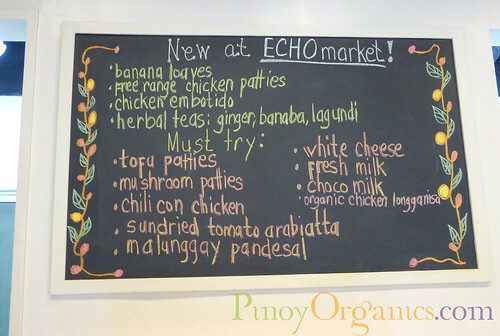 The freshest organic vegetable and fruit produce, free range chicken and meats, fresh milk and eggs, and artisan breads and cheeses are made available seven days a week at the newly opened ECHOmarket Sustainable Farms in Serendra. The latest brainchild of ECHOtrio (Chit Juan, Jeannie Javelosa, and Reena Francisco) behind ECHOstore Sustainable Lifestyle, ECHOmarket embraces the same philosophy of sustainability–supporting local food producers and organic farmer groups all over the country. We dropped by last week and young and promising in-house chef, Angelo, and store manager, Lorna, showed us around their green store. What got us excited was their chiller packed with salad greens, vegetables and ready-to-eat food items. On their racks were fresh fruits from organic farms. In another corner were accessories and dry-goods manufactured by various communities supported by the ECHOtrio Chit Juan, Jeannie Javellosa and Reena Francisco. Is there a hard-to-find staple that you want our two green grocers to source for you? Thanks Joey for the Sugarleaf write up! Wishing more success on your blog and Let us all make a progressive Philippines Organic and Natural Healthy Lifestyle Market a True Pinoy Advocacy! 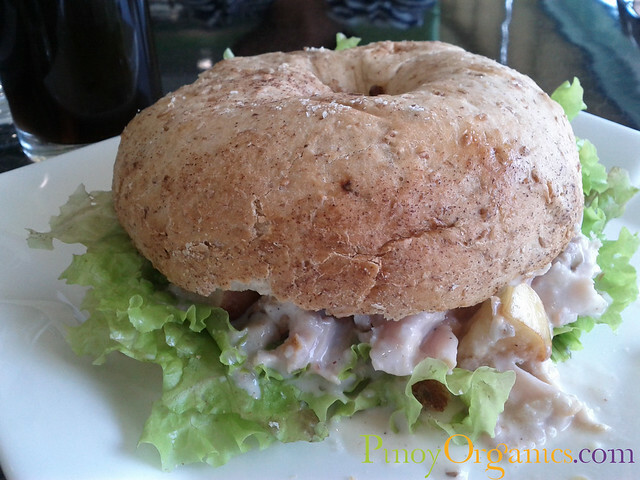 I am happy that organic is becoming more available in Manila. 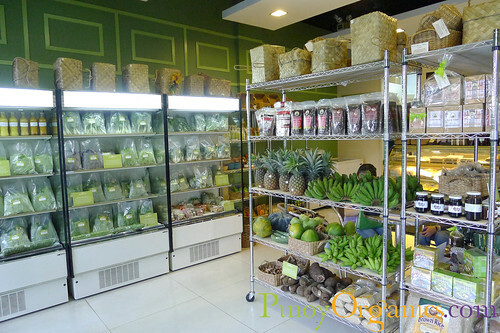 I hope more organic grocery stores will open in Alabang. 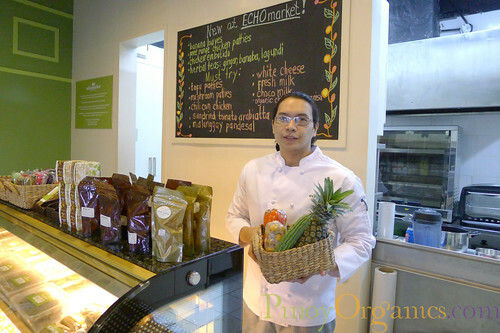 Adelle, Juan Market is an online grocer selling local organic products nationwide. Lucky YOU! Their fresh farm produce (vegetables, fruits, farm meats) is currently limited/available in Ayala Alabang Village, BF Paranaque and Alabang Hills only. Check them out! This is great. Slowly but surely, organic produce is being re-introduced to our culture, our everyday lives. However, while we are not dirt poor, we are still not capable of buying these goods, definitely not on a regular basis. Once in a blue moon maybe. Besides, there are not many shops that are readily accessible to most of the populace. I dream of the day when this would be the norm in our society, when these products can be more readily found in the market and made more affordable to the ordinary Filipino. About organics as expensive, most organic & natural foods are nutrient-dense so you don’t have to consume a lot to get what our bodies need. Start with rice and that’s 50% already of what we eat everyday. Our organic rice is cheaper by P5 than this popular brand of rice in the supermarket that our friend buys. Also, by giving up canned & processed foods, we have saved a lot to make up for the price difference.